Texas Ranger Brody Calhoun is with his parents in west Texas when an unexpected attack injures the brother of Rebecca Morgan, Brody's high school sweetheart. The local sheriff, a good friend, asks for Brody's help. At first, it seems an open-and-shut case. As Brody digs deeper, he realizes the attack may be related to an organized crime trial Rebecca will be overseeing. With Rebecca's help, he compiles evidence involving cattle rustling, bribery and dirty payoffs that shatter the entire community and put Rebecca directly in the line of fire. Brody expects to protect her. What he never expects is to fall for Rebecca all over again, or for a murder to throw the case wide open. Is Brody's faith strong enough to withstand not only deep-rooted corruption and cattle rustling but also love? This is the third book in the Men of the Texas Ranger's series, but the first one that I have read in the series. Even though I hadn't read the other books in the series, I was able to follow along and it read like a stand alone novel. Let me just say it kept you on the edge of your seat. There was action throughout the book and I kind of suspected who was behind the threats to Rebecca's family, but you really don't find out till towards the end. It had a great Christian message and of course the love story ended in a great way. Great job Margaret. I look forward to more great stories by Margaret Daley. Margaret Daley, an award-winning author of eighty-three books, has been married for over forty years and is a firm believer in romance and love. When she isn’t traveling, she’s writing love stories, often with a suspense thread and corralling her three cats that think they rule her household. 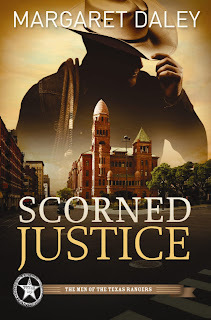 Her latest book is the Christian fiction, Scorned Justice.